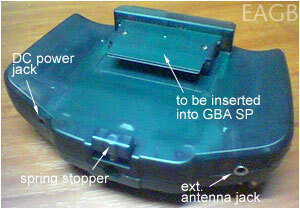 Awhile back, EAGB reviewed a TV Tuner for the Game Boy Advance. During that time, the GBA SP was still light years away--no one had even dreamed of Nintendo announcing its development or release. So it wasn't much of a surprise when the TV Tuner turned out to be incompatible with the GBA SP. with a GBA SP attached. We recently got a new TV Tuner unit made by the same manufacturer, but this time around, it's GBA SP compatible. The packaging, box and contents are exactly the same as the old TV Tuner, the only difference being the "for GBA & SP" sticker on the front; would-be buyers should carefully specify this if they want to use this with their GBA SPs, lest they end up with a GBA-only unit. Watch TV on your GBA. Store up to 99 channels. Built-in help menu and on screen commands. Accepts RF/AV signal input, enabling the GBA to be used as a monitor. Available in NTSC or PAL system. A/V in & out jack. Installation of the TV Tuner is a snap and worry-free; you don't have to open up your GBA SP or anything to attach it; all you have to do is insert it like a regular cartridge into the GBA SP. There's also a spring stopper at the back that's supposed to secure the GBA SP in place, but the fit in the cartridge slot is already snug, so there's no problem with it. The basic TV Tuner receiver. The "front" area of the Tuner. The TV Tuner can be powered in two ways; you can either use 4 alkaline or rechargeable AA batteries, or plug it in a wall socket using the supplied DC adapter. One important thing to note about this device is that it doesn't power the GBA SP itself, so you have to make sure your GBA SP's battery is adequately charged. 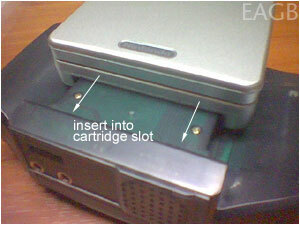 Before you use the TV Tuner, you have to insert a GBA cartridge inside the tuner cartridge slot, or it will not work. This is because it uses the boot up sequence of GBA cartridges to activate it--any GBA cart will do. Using this device is rather simple. The first time I booted the TV Tuner, I was greeted with a brief screen full of static with some text at the top, then it immediately jumped to the first VHF TV station available in our area. Now this is the first time I've used a device like this hands-on; I didn't review the old TV Tuner, so seeing that live broadcast on my GBA screen for the first time was a shock--the actual picture quality was clear and sharp, it took me a moment to realize that I was indeed watching TV on a GBA SP. Of course, the GBA SP's built-in front light helps a lot, as it entirely dispenses with the "dark screen" problem encountered when using a GBA with the TV Tuner. Screenshot of a regular TV broadcast. Picture reception will be dependent on your location; in our area, using the telescopic antenna alone was enough to get a clear picture, but in some areas where the reception isn't that good, you can plug in an external antenna through a supplied cable. Pressing the L or R shoulder buttons will bring up a help menu that lists all the commands available for the TV Tuner. These commands are basically combination keystrokes of the Select, Start, A, B, and joypad direction keys, where you can do anything from adjusting brightness and contrast, to manual or automatic scanning and storing of channels (the tuner can store up to 99 channels in memory). 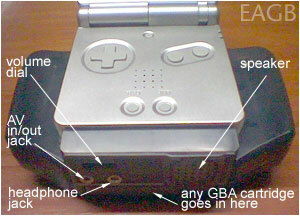 The TV Tuner's sound is not output through the GBA SP's speaker; instead it comes out through a built-in internal speaker, which you can adjust through a volume control dial. I was particularly impressed with the sound quality as well--even though it's mono, the sound is quite loud and clear. An included A/V cable opens up the TV Tuner to a lot of possibilities. I tried connecting it to a VCR, a DVD player, and even a PlayStation 2. As with its TV broadcast quality, all the resulting displays on the GBA SP from these external devices were sharp and clear, without any drop in framerate whatsoever. The photos I've taken don't really do the actual TV Tuner displays justice, you have to see it for yourself in order to be fully convinced. 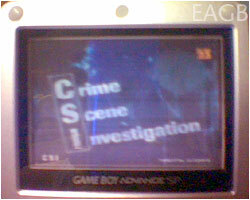 displayed on a GBA SP. 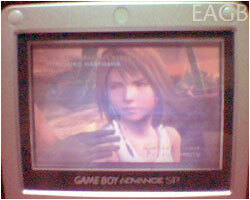 It was quite fun to actually see Final Fantasy X running on the GBA's tiny screen, as well as DVD movies in widescreen format. Of course, I wouldn't go that far as to regularly use the TV Tuner for PS2 gaming or DVD viewing, but the fact that it's possible to use it as an external monitor is remarkable in itself. Since the TV Tuner's design and shape is obviously meant for a GBA, whose orientation has its cartridge slot on top, you'll get some minor problems when using it with a GBA SP. 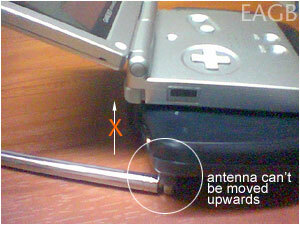 The main problem I noticed has to do with the telescopic antenna; when using a GBA SP, the unit has to lie on its back, and the antenna can't do anything more than extend outwards--you can't possibly move it upwards due to a limitation of the antenna's joints (see photo). Telescopic antenna can not be moved upwards. 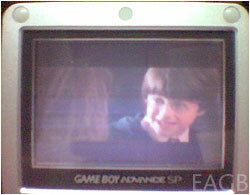 Using the TV Tuner with a GBA makes the entire thing bulky, but the GBA SP's slim formfactor makes it less voluminous. True, the side "wings" extend out somewhat, but I've noticed that they make excellent side grips if you're holding the unit. Let's hope that the manufacturer will come out with unit redesigns in the future to complement the GBA SP's design. 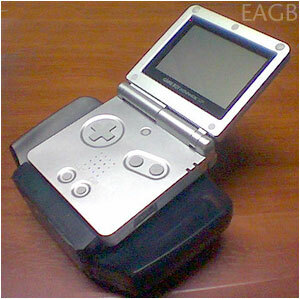 And lastly, the included stand is virtually useless now with the GBA SP, unless you want to watch TV upside down. The TV Tuner is an amazing add-on device for the GBA SP--picture quality and sound are excellent, and with the GBA SP's frontlight, you can be assured of a nicely lighted screen that you can watch even in the dark. It's easy to install and operate, with all the commands you need available in one keypress, and it even works as an external monitor. If you're the type of gamer that also needs to watch TV on the go, the TV Tuner is one very handy, must-have portable gadget for you.